Dale Robertson, seen here in red during his previous spell at Tayport, appeared for the club as a trialist at the weekend. Tayport will be hoping to bounce back from last weekend’s shock cup defeat against Lochee Harp when they play another cup tie tomorrow. This time the club find themselves in the inter-regional Signature Signs Cup, with the region’s top outfit, Lochee United, providing the opposition. It will be a tough assignment for Stevie Kay’s men, who will have to be at their best if they are to be the team to cause an upset this weekend. Manager Kay told the Herald in the lead up to last weekend’s tie with Harp that he believed the club, which plays in a division lower, was in a false position. And they proved him to be right, rebounding from an early Tayport opener to record a comfortable 3-1 victory. For last week’s loss to Harp, ‘Port did have to include a couple of trialists to bolster the squad and one, former Tayport player Dale Robertson, not to be confused with Dayle, started the game. Long-term, manager Kay will be hoping to make additions to his pool, as he has lost a couple of players over the festive break. 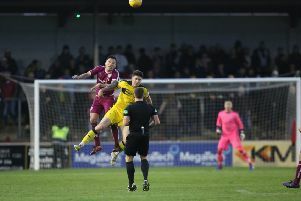 Conrad Courts, who had been on loan at the club, opted out of his deal, due to injury and Stewart McConnachie moved back to Broughty in a swap deal, which brought experienced ‘keeper Chris McPherson to the Canniepairt. That move addressed the goalkeeping situation, but has reduced Kay’s outfield options. Hopefully, everyone will be available for Saturday’s trip to Thomson Park, where the match is due to kick off at 1.45pm. If level after 90 minutes, the tie will be decided by penalty kicks. In a midweek friendly, Tayport recorded an impressive 5-1 win against amateur outfit, Cupar Hearts. Luke O’Brien scored a couple of goals for his side, while Harris Kay, Grant Paterson and Chris Liversedge were also on target.